Heat oven to 350 degrees. Lightly spray an 11×7-inch baking dish. Cook ground turkey until done; drain fat. In a medium bowl, mix Cream of Mushroom Soup together with the cooked ground turkey. Season to your liking. Spread ground turkey mixture into bottom of baking dish evenly. 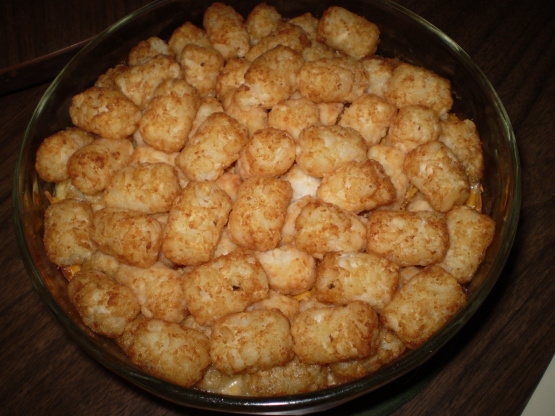 Arrange frozen tater tots across top of ground turkey mixture until covered. Sprinkle cheese evenly across top of tater tots. Sprinkle chopped green onions if desired on top of cheese. Bake casserole in a 350 degree oven for approximately 30 minutes or until tater tots are cooked and cheese is melted.